Fred R. Barnard (or Napoleon Bonaparte) once said that “A picture is worth a thousand words.” Or at least something like that which has made its way into our daily lexicon. Well the above image sure fits the bill. (No pun intended.) By now I’m sure you know the story that caused the picture to be taken. But besides that, what does it tell us? …when you compare the image up top with a.) years of zero contact and world-wide estrangement spawned by the "Axis of Neocons," and then b.) more years of regular, but rather painful airport photos of Bush N. Korea envoy Chris Hill, mostly flying in and out of South Korea empty-handed, the Clinton photo serves as the exclamation point on a profound but rather simple concept being transfused into Washington since the inauguration. The real star in this picture is the tremendous painting in the background. It dominates this cast of characters. Is it a raging symbol of strength? Is it a tsunami of power? If it’s to send a message that North Korea is a force to be reckoned with, they should probably lose the tacky casino carpeting in the foreground. I love this painting. It lends energy to a pose that could serve as a model for a wax recreation in a Pyongyang Madame Tussaud’s. Judging by this photo, one would never believe that this was to commemorate the triumphant release of two American journalists who were facing twelve years of hard labor in a North Korean prison for illegally entering the country. This event is simply a footnote to Mr. Kim’s larger political message. 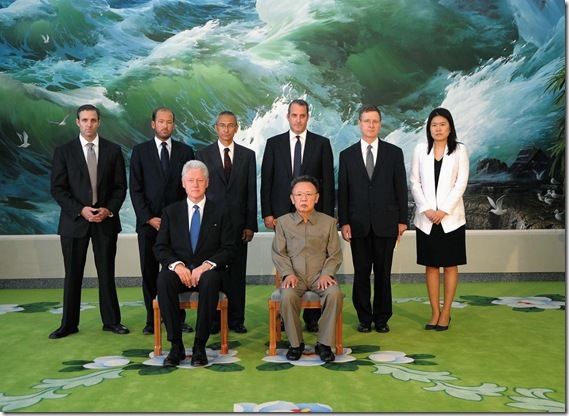 Finally, Eric Gibson, the Leisure and Arts Features Editor at the Wall Street Journal seems to agree on the painting’s star status� and takes his analysis even deeper in an interesting piece Why Dictators Love Kitsch. The message of the painting, located in what appears to be the presidential palace, is a simple one: Kim Jong Il’s regime as a force of nature. The painting has a split personality because it aims to convey two distinct messages simultaneously: The soft light and gamboling birds conjure up thoughts of a natural paradise, an allusion to the “paradise” such regimes believe they are creating for their subjects. The crashing waves are a metaphor for the overwhelming power of the state and its Great Leader ready to crush all enemies. Whatever your take is on this photograph and painting, there’s no denying that it is a rather bizarre scene. We can only imagine what the atmosphere was like as the “models” assembled for it and wonder about the initial reaction in the White House and State Department when if was released. Posted in General Leadership, Politics + Government. Tagged with BAGnewsNotes, Bill Clinton, Fast Company, Kim Jong Il, Wall Street Journal.